T-Shirts & Fundraising. What gets YOU fired up? Are you a student, teacher, parent, grandparent or just the occasional “crazy” aunt or uncle? We all have our passions. So for the cause or team you want to promote and support, Rankin has great news…YOU CAN DO THIS and Rankin Textile Printing will show you how! What makes you “tick”? Is there a need in your town or state that you believe in? Aw come on, we both know you’re just brimming with ideas. Whether it’s a new witty slogan or maybe a slice of sarcasm. What’s that thing you say that makes your friends ROFL? Start there! OK, so now you have a great idea. But what do you DO with it? Step #3: Creating a fundraising store. Follow the instructions on this form, and click “submit”. Bang-Zoom, you now have an online fundraising store! And as soon as its approved (usually within 24 hours), its time to unleash your creativity. Design custom T-Shirts, Caps, Jackets and more with Rankin’s FREE online Tools. Rankin Techs will advise on the best method to apply your designs using Dye sublimation, Wrap-around printing, Embroidery or Tackle Twill. Use your cause’s name and mascot and whatever else is part of your group. Now your designed apparel is live and ready for sale. Let’s get busy! Step #4: Your school or cause makes money. By selling school and cause-related t-shirts, sweats, caps and other apparel, your organization can receive a commission on all items sold through your Rankin Store. These are paid out starting when $50 in sales are generated through your online store. The more you sell, the more you make. And tracking your sales is easy thanks to Rankin’s online store management interface and reporting. Step #5: You decide what to carry. If you’d like Rankin to suggest what items to offer, we’re happy to help. But if you KNOW that your group is CRAZY about custom T-Shirts or Ball Caps you can choose to carry those items. 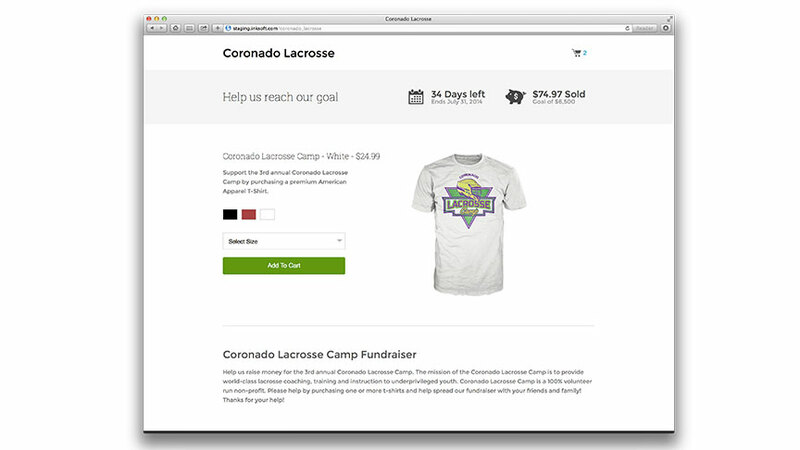 Regardless, you can select from more than 1,000 products to add to your fundraising store and the bigger selection, the easier it is to sell your school or cause-related apparel. New products are added often, so check in on our product list or sign up for our newsletter. Step #6: Does paperwork scare you? Rankin Textile Printing has you covered. Our duties for your online store include: Inventory, Payment Processing, Production, Packaging, Shipping and Accounting. WooWEE, how’d YOU get to be the industry tycoon? And all of that happens at no cost to you. The Rankin Techs are ready to serve because we know what it takes to deliver beautifully embroidered and custom t-shirts and ball caps for your worthy cause. Step #7: Just one more thing…Marketing! If you’re a Social Media God, go for it! But if you find the need for a little (or a lot) of help…its Rankin to the rescue. We’ll provide links for you to use on Twitter, Facebook, Google+ and multiple others. Share these with your friends and watch them flock to your store. These can be shared seasonally or, if you want to continue fund raising, all year long. Regardless of the route needed to achieve your desired results, an experienced Rankin Custom Printing and Apparel Specialist will be here to help you every step of the way.